It’s not every day a research paper sparks a stock sell-off on Wall Street. The reverberations began shortly after Daniel McCarthy, assistant professor of marketing, and his co-author Peter Fader, a professor of marketing at Wharton, published a journal article exploring the valuation of two e-commerce companies, Wayfair and Overstock.com. Using a methodology they named customer-based corporation valuation,” or CBCV, the researchers produced valuations on contractual and non-contractual companies based on customer value. This method is particularly useful for companies that rely heavily on returning customers or subscription models. McCarthy and Fader used CBCV to conclude Wayfair spends about $69 to acquire each new customer but earns only $59 after that acquisition. Overstock, in contrast, earned a profit of about $10 for each newly acquired customer. The upshot? The researchers estimated Wayfair’s stock was overvalued by 84 percent, while Overstock was undervalued by 11 percent. “A famous short-seller began to tweet about the article, and Wayfair’s stock price fell about 9 percent in a day,” said McCarthy. McCarthy was featured on the CNBC show Mad Money, and soon his article and its implications were being mentioned in a number of leading media outlets, including the Wall Street Journal. The article, or more accurately the valuation process described in the article, continues to receive attention because of its impact on business. McCarthy’s CBCV framework sheds light on a very difficult problem — how do you quantify the incremental cost and value of acquiring and retaining customers at direct-to-consumer businesses? Further, how do these factors affect the financial valuation of the business? These questions aren’t asked by researchers with views of the campus quad. They are asked daily by men and women with views of earnings reports, investor portfolios and the world’s largest stock exchanges. Customer loyalty and retention is another area where McCarthy has used his methodology to enlighten businesses. He studied the unique world of delivery meal kit companies like Blue Apron to assess in more detail how long customers remained with the brand. Meal kits were a $5 billion business in 2017 and are projected to grow at a 20 percent annual rate in the years to come. Competition in this direct-to-consumer industry is fierce. Using publicly disclosed SEC data, McCarthy found customer retention numbers shockingly low. For example, in April, the proportion of customers remaining six months after signing up is just 28 percent at Blue Apron and 17 percent at HelloFresh. Consumers tend to cycle through meal kit providers as they offer promotional deals for new customers, so spending too much to acquire new customers may be a loss-making strategy for the company. By using sophisticated predictive modeling, McCarthy generated a forecast of what customers do after they are acquired. He used this to calculate how much these firms should spend to acquire new customers. “Luckily, direct-to-consumer subscription businesses are fastidious in their collection of customer data, and that’s what initially pulled me into researching them,” he said. Not only is McCarthy’s methodology shaking up the way investors value private and public firms, but his research is knocking down the barriers between marketing and finance. “This work opens the communication channels between the marketing departments and the finance departments — the CFO, CMO and CEO — and shows them how all the actions marketers take, how customers are treated, will actually affect the stock price of firms,” he said. McCarthy is pleased by the response to his research and, in fact, wants it to have practical applications. He co-founded Theta Equity Partners to apply customer-based corporate valuations to private equity firms, venture capitalists and hedge funds. “In addition to having perspective from academia, I will actually have some tangible examples and real-world experience to draw from,” he said. If anyone understands the impact of a theory that changes behavior and shapes corporate strategy and policy, it’s Jagdish Sheth, Charles H. Kellstadt Chair in Marketing. Sheth’s groundbreaking theory of generalists and specialists in the world of corporate competitors, and how companies caught in the middle were unlikely to survive, set the stage for a number of corporate mergers. This research has also been used in antitrust lawsuits related to M&As. 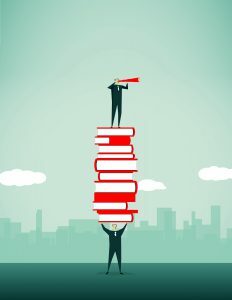 A subsequent book, The Rule of Three: Surviving and Thriving in Competitive Markets, brought the theory to a wider audience. Sheth’s research into client loyalty and the book Clients for Life: How Great Professionals Develop Breakthrough Relationships helped to shape how financial planners, wealth managers, lawyers and accountants establish themselves as trusted advisors. “When there’s a surplus of human capital, it’s important to understand how to transform from an expert-for-hire to a trusted advisor, because expertise can be sourced from Google,” he said. Sheth’s theory of buyer behavior ushered in a new (and more nuanced) approach to consumer psychology and marketing for companies across the globe by providing an understanding of why consumers become brand loyal. Today, firms face tremendous difficulties gaining and retaining customers in an increasingly competitive, global and dynamic business environment. Clearly, consumer psychology is something businesses need at the forefront of strategy, but hitting the mark with a consumer is so often like aiming at a moving target. That’s where the seasoned researcher steps in. “In a rapidly changing environment, business leaders can’t always anticipate what will happen next,” Sheth said. Geopolitics and cultural influence can change how a company makes and markets its clothing or the type of car it chooses to advertise or import, he said. Immigration can impact the need for a different type of product or service. “Businesses have to be prepared to improvise and adapt to the needs of the customer,” he added. For example, Sheth notes how salsa supplanted ketchup as the most popular condiment in the U.S. He attributes that shift to the influence of a growing Hispanic population and an adaptation of traditional American tastes. According to Sheth, academics also need to adapt to stay connected to the issues that are most pressing to society. He admits academic study used to be a much more detached process, but now there is a dialogue between academics and industry leaders, leading to innovative research that provides timely solutions to policy makers. His latest research? How differences in climate determine cultural differences in food, shelter and clothing as well as traits such as punctuality and uncertainty avoidance. Her latest work examines how shareholders — always a focus of publicly traded firms — can negatively impact innovation. “Shareholders are often blinded by their short-term financial interests, keeping some businesses stuck with outdated technologies,” she said. The article attracted the attention of Harvard Business Review and was published on the site in August under the title, “When Companies Want to Innovate, but Investors Won’t Let Them.” As one of the most popular business publications in the world, Harvard Business Review made the work mainstream. In the study, Bharadwaj and co-authors completed a sweeping study of U.S. companies, including GE and Tesla, to better understand investors who value a company for its immediate profits versus its potential for future growth after an investment in digital technology. Established and high-profit businesses suffered lower stock market valuations for this sort of innovation,while growth companies were rewarded by the market for the same sort of technology initiative. Bharadwaj proposed a number of solutions for high-profit businesses facing the issue, including a more strategic use of communications to help investors understand the digital transformation. Such action can be taken quickly and with confidence thanks to one of the age-old elements of academic research: time. Researchers provide businesses with sometimes painstaking collections and reviews of data, then add a healthy dose of carefully considered conclusions. In Bharadwaj’s study on investors and innovation, for example, 24 years’ worth of data was examined (from 1984 to 2008). “The data collection in this case was a huge step, as the study uses information from the early 1980s, and we needed to access and merge data from a variety of sources, such as theGoogle Patent Database and financial and stock price databases from multiple sources,” she said. A lengthy and elaborate peer-review process for scholarly journals, while not for immediate gratification, also helps validate the findings. Other timely research gets disseminated to the popular press, into a published book or in a class syllabus. Once that happens, a professor’s work can have a far-reaching effect on business and public policy. Important as investors may be, companies have many inputs to success, and human capital can be one of the most valuable. Yet corporations struggle to retain the most skilled employees. Conventional wisdom — and recent research — suggest a motivated and well-trained employee is less likely to abandon ship. Kristy Towry, vice dean for faculty and research, John M. and Lucy Cook Chair and professor of accounting, concentrates her research on managerial accounting, or the use of accounting information to make managerial decisions. She focuses on managerial control systems, including financial incentives. Her research uses experimental methods, utilizing theories from the worlds of economics, psychology and other social sciences to provide a window into complex managerial problems. Keeping employees motivated and well trained often requires a better understanding of management control systems — the various tools used to ensure the organization is effectively pursuing its strategy. “With a well-designed control system, employees are able to learn over time what behaviors and actions will lead to the best outcomes, benefiting the organization and its employees,” Towry said. Managers hear quite a bit about experiential learning in business schools, but Towry said “vicarious learning” — learning by watching coworkers — offers even more opportunities to gain knowledge. When employees are able to observe the successes and failures of coworkers, they process the information in a more holistic manner. Towry’s research is helping organizations think about the best ways for employees to share their “war stories” with coworkers instead of placing employees in the spotlight for their mistakes. The next phase of her research deals with the physical responses resulting from employees putting effort into work. Managers empowered with such information can make better decisions, make sure employees are satisfied and help ensure a healthy workforce. While Towry’s research is certainly cutting-edge, the potential business applications remain at the heart of the work. Erika James, John H. Harland Dean and professor of organization & management, views such a link between academia and industry as a symbiotic relationship. Since assuming the role of dean in 2014, her drive to collaborate with industry has provided the business school with a way to showcase its research talent. “It’s always been important to have a strong relationship between business and business schools,” she said. “However, as the world evolves, there needs to be a way to move education and innovation beyond and think about how schools can help drive change in a way that positively impacts the future. Investigating patient outcomes Recent research by Diwas KC, associate professor of information systems and operations management, has direct applications to an industry in much need of innovation and hope for the future: healthcare. “Many of the issues in the industry seemed like operations management problems,” he said. The American Hospital Association found hospitals are closing at a rate of about 30 a year. Rural hospitals are particularly at risk. From 2010 to the beginning of August 2018, the National Rural Health Association found that 87 rural hospitals shut down. While technology has helped to transform and streamline some parts of healthcare, it alone cannot be the saving grace. According to KC, it takes time to figure out the many hurdles to surmount in a complex system deeply entrenched in doing things a set way. One of the major challenges hospitals face is readmissions. “When people are likely to bounce back and be readmitted for surgical complications, care becomes much more expensive,” the researcher said. In one stream of KC’s research, he found readmitted patients would often stay three times longer than the original stay. The reasons for readmission are multifold, of course. Hospital closures are putting increasing pressure on the remaining ones, resulting in increased bed occupancy rates. The rush to get patients out of the ICU, to a hospital room and out the door sometimes leads to readmission for complications. His research came up with a solution. Instead of taking a patient from the intensive care unit to a hospital room, he proposed creating a less-costly intermediate care unit. The patient could leave the ICU and transition to this “step-down unit” and not be rushed into a hospital room. There would be fewer medical professionals needed in the step-down unit, but a full-time attending physician would still be on staff. KC saw his idea implemented at a large teaching hospital on the East Coast in 2009 and 2010. The step-down unit led to fewer bounce backs and the ability for more capacity in the ICU, improving patient care and, ultimately, saving money for the hospital. Pinning down the cost of care Steven Culler takes a more cross-disciplinary approach when it comes to healthcare research and its day-to-day applicability. As an associate professor in health policy and management at Emory University’s Rollins School of Public Health and an adjunct associate professor of finance at Goizueta, he has a unique vantage point when it comes to the study of hospital inefficiencies and patient care. “No one would suggest scrimping on patient care to save costs, but there are areas for analysis in operations management that might suggest a better pattern of care for hospitals to follow,” Culler said. One of his most important findings comes with pinning down the total cost of care. He looked specifically at knee surgeries and cardiac procedures as examples. By using Medicare data, Culler and his co-researchers were able to track a sampling of patients through the course of their care, from admittance through surgery, as well as readmission for adverse occurrences or additional episodes of care. “The system is so siloed that few know how many different places of care patients accessed or how much it all costs,” he said. The researchers traced post-acute hospital care, such as admittance to skilled nursing homes or rehabilitation facilities, which are often left out of the cost equation for a typical treatment episode. Culler says academia is uniquely qualified to provide such insight — a deep dive into the utilization of healthcare resources provided by many different stakeholders. That knowledge translates into innovation, which can be applied to shareholder value, the new economy, marketing strategy or employee learning. And it is, of course, in innovation that business makes a lasting impact on society. Some research is empirical in nature, confirming and reassessing conclusions, while other projects strike out onto new paths of thought and ideas. It is in the combination that faculty research has its greatest effect. “It’s not the individual paper or book, but the body of literature that emerges, which prompts the change in thinking,” Towry said. According to Sheth, the business world is much more receptive of academic research, especially as more companies rely on data mining and algorithms to target customers, better understand employees and assess operations. In the case of McCarthy’s valuation model, it also affects the bottom line. “There’s simply too much data mining without an understanding of the relevance to the policy maker,” Sheth said.